Best in the market Magento 2 Extensions are available for your Online store. Our magento plugins are being used in Thousands of Customer websites world wide. We use Composer (Application Package manager) to develop and verify the extension for compatibility. All our extensions are reviewed and approved by MagentoTM team for programming, code compliance and compatibility. As of today 2218 clients are using our products and services so far. GET STARTED. Choose from our Magento 2 extensions and become our client today. 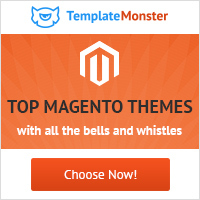 Hundreds of Magento themes to choose from! SALE - Special promotion ends today!